Learn more about how the SRF Lessons can transform and bring balance to your life. Excerpts from the inauguration of the new edition of the SRF/YSS Lessons, conducted by Brother Chidananda, president and spiritual head of Self-Realization Fellowship/Yogoda Satsanga Society of India, at SRF International Headquarters on January 31, 2019. The event was livestreamed to SRF/YSS members and friends around the world. A video of the complete event is also available. Paramahansa Yogananda viewed the Self-Realization Fellowship Lessons as the very core of the teachings he was ordained to bring to the world as a special spiritual dispensation for the coming global civilization. In his talks and writings printed in his many acclaimed books for the public, Paramahansaji offers a wealth of practical guidance for spiritual living — how to live joyfully and successfully amidst the unceasing challenges and opportunities in this world of change. The Self-Realization Fellowship Lessons are for those who want to learn to convert that inspiration into a daily spiritual practice. The Lessons are unique among Paramahansa Yogananda’s published works, in that they give his step-by-step instructions in the yoga techniques of meditation, concentration, and energization that he taught, including Kriya Yoga. These simple yet highly effective yoga techniques work directly with life energy and consciousness, enabling you to recharge the body with vitality, awaken the mind's unlimited power, and experience an ever-deepening awareness of the Divine in your life—culminating in the highest states of spiritual consciousness and union with God. Since Yoga is based on practice and experience rather than on adherence to a particular set of beliefs, followers of all religions—as well as those who do not affiliate with a religious path—can benefit from the spiritual teachings in the basic series of Lessons and the techniques taught therein. When practiced regularly, these methods lead unfailingly to deeper levels of spiritual awareness and perception. 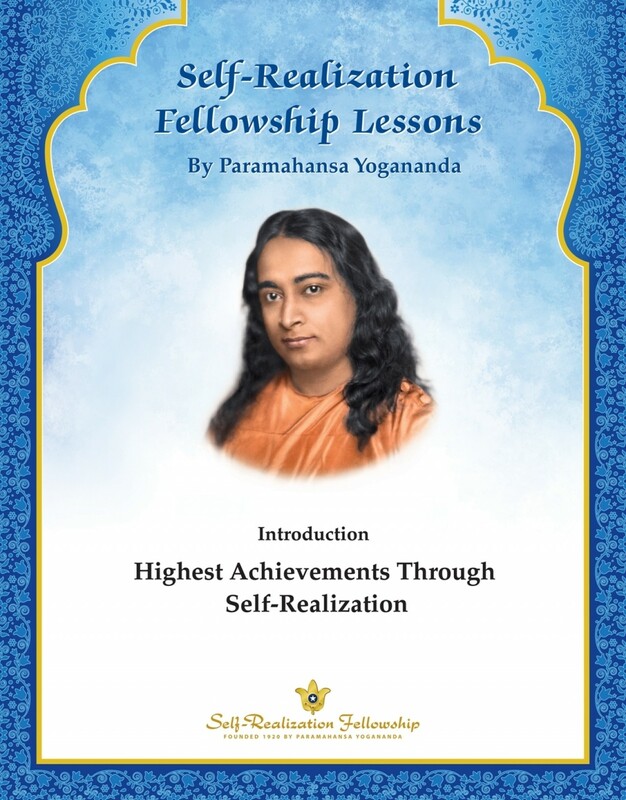 An inspiring and in-depth overview of the teachings in the Lessons is given in Paramahansa Yogananda’s introduction to the series, entitled “Highest Achievements Through Self-Realization,” available on request here. As a first step, we suggest that you read and absorb the thoughts in this introductory Lesson. This will enable you to determine if you wish to go further on the journey to Self-realization by enrolling for the course of eighteen Lessons that teach the meditation techniques that prepare one for initiation in Kriya Yoga. You may also enroll right away by following the instructions on this page under the “Apply for the Lessons” tab. In his Autobiography of a Yogi, Paramahansa Yogananda introduced the lineage of illu­mined gurus behind the Self-Realization Fellowship work: Mahavatar Babaji, Lahiri Maha­saya, and Swami Sri Yukteswar. He describes how these fully God-realized masters chose and prepared him to bring the lost, ancient Kriya Yoga science of God-realization to the West and spread it worldwide. Enrollment in the Lessons offered by Self-Realization Fellowship, the organization Paramahansa Yogananda founded to disseminate his teachings and for the continuing fulfillment of his mission, will insure proper guidance and optimum benefit for all who wish to follow the path and practice the sacred meditation techniques he brought for the world. During the three decades of his mission in the West, starting in 1920, Paramahansaji presented his teachings through a variety of means. In the 1920s and ’30s, he traveled all over the United States, giving public lectures in major cities from coast to coast, attended by tens of thousands. Many of these talks were printed in Self-Realization Fellowship’s magazine, and (much later) in the anthologies of his Collected Talks and Essays, available in book form for the general public. Following his public lecture series, which lasted one to two weeks in each city, he invited those who wished to commit to a deeper study to enroll for the additional series of lessons classes on the Self-Realization teachings and meditation techniques that he conducted each night over the next several weeks. In the early years, students were provided with brief printed outline notes about the subject matter in each class. Thus the Self-Realization Fellowship Lessons were born. The series was assembled over the course of several years, from 1934 through about 1938. The early disciples with whom Paramahansaji worked on this project often had difficulty getting each new Lesson prepared and printed in time to meet the weekly mailing deadlines—particularly since the Guru was absent for a year-and-a-half long journey through Europe and India during 1935–36. Nevertheless, the series was eventually completed and remained in circulation, with some improvements and modifications, until 2019. Coming Soon: "History of the Self-Realization Fellowship Lessons"
In the last years of his life, the Guru devoted himself to an intense period of writing new material and review of his previously published works. Among other projects, he worked on the Lessons personally with Sri Mrinalini Mata (who was then a young disciple, and later served as the fourth president of Self-Realization Fellowship/Yogoda Satsanga Society of India). Paramahansaji reviewed the Lessons presentation with her and instructed her in his wishes for a thorough revision, noting a number of problems and defects that he wished to address. He told her to draw from the many writings and talks he had given in the intervening years since the Lessons were first compiled. “The Lessons will be your life’s work,” he said to her. The result of that “life’s work” is the current series, completed shortly before her passing in 2017—featuring vastly improved organization and a wealth of new material from Paramahansaji that was not available for the original 1934 compilation. This new edition of the SRF Lessons is the most comprehensive ever offered, and includes much inspiration and teaching that was never previously published. To begin, all students receive a mailing every two weeks for 9 months. The 18 in-depth Lessons (approximately 24–40 pages each) sent during this period include the preliminary steps of the Kriya Yoga science: the Energization Exercises, the Hong-Sau Technique of Concentration, and the Aum Technique of Meditation. These techniques are described in the introductory Lesson, “Highest Achievements Through Self-Realization,” by Paramahansa Yogananda. In addition to the meditation techniques, these Lessons provide an overview of all the other most important topics in Paramahansaji’s teachings (though complete presentation of some topics is given in separate Lessons in the Supplement Series described below). This series of 5 Lessons gives instruction in the technique of Kriya Yoga for those who qualify by having established a regular practice of the three principal meditation techniques given in the basic SRF Lessons. Initiation in Kriya Yoga is a sacred step that involves a deeper commitment to the spiritual path of Self-Realization Fellowship and the establishment of the guru-disciple relationship with Paramahansa Yogananda. The student will receive an invitation to apply for Kriya Yoga with Lesson 17. However, even if the student decides not to apply for initiation in Kriya Yoga immediately, he or she will gain a thorough grounding in effective meditation practice and spiritualizing one’s life in the 18 Lessons of the basic series. And regardless of whether one applies for Kriya initiation, all SRF students are welcome and encouraged to enroll for the weekly Satsanga With Paramahansa Yogananda series, described in 5., below. They may also order any of the Supplement Lessons described below, after completing the basic 18 Lessons. At any time after completing the basic 18 SRF Lessons, students are invited to order any or all of the Supplement Lessons. As with the other Lessons, these present Paramahansa Yogananda’s personal instruction, compiled from his classes and writings, for Self-Realization Fellowship students. The Supplement Lessons contain in-depth presentations of key subjects for followers of the Kriya Yoga path to God-realization. They are grouped by topics and themes, in order to give students a deep and comprehensive understanding of subjects that are of particular interest to them. Advanced Lessons are available for those who have received Kriya Yoga. These present Paramahansa Yogananda’s deeper instruction in many of the principles and techniques of the SRF yoga path. This special series of Lessons is for Kriya Yoga initiates who are interested in and qualified to receive the Second, Third, and Fourth Kriya Yoga techniques. In addition to the actual techniques, instruction in auxiliary practices such as Khechari Mudra and other advanced techniques for Kriya Yogis is imparted in these special Lessons. This series is available to all who have completed the basic series of SRF Lessons described in 1., above. Satsanga means “fellowship with truth.” In India’s ancient spiritual tradition, a satsanga is a gathering where the spiritual teacher meets with devotees for meditation and imparting spiritual teaching and inspiration. “When I am gone, the teachings will be the guru,” Paramahansa Yogananda said. The mailings in this series provide all followers of Paramahansaji with a lifelong, continuous contact and attunement with the spiritual power flowing through his teachings. Each “Satsanga” in this series is about 6 pages in length, and is focused on a specific topic, compiled from the voluminous library of Paramahansa Yogananda’s previously published writings, classes, and talks. The Satsanga With Paramahansa Yogananda series is not studied sequentially. All persons receive the same mailing each week, regardless of when they enroll. In addition, these “Satsangas” are used as the topics for Sunday services conducted by SRF monastics in SRF temples, and as service readings in SRF centers and meditation groups worldwide. (They are a revised and much-expanded edition of the SRF Service Readings in use for the past few decades.) Thus, by enrolling for this series of mailings, you will be linked in fellowship with SRF/YSS members all over the world, since through these “Satsangas” all SRF/YSS members will be focusing on the same spiritual topics together each week. Application for Kriya Yoga may be made after completing the first sixteen Lessons in the basic series, a period of approximately eight months if the Lessons are studied without interruption as they are received on a biweekly basis. Initiation in Kriya Yoga signifies formally establishing the time-honored guru-disciple relationship with Paramahansa Yogananda and his lineage of enlightened masters. Kriya Yogis pledge their spiritual loyalty to the Gurus and to Self-Realization Fellowship. In Lesson 16, you will receive an in-depth explanation of the holy guru-disciple relationship, and of the spiritual duties and commitment inherent in acceptance of this relationship. In Autobiography of a Yogi (chapter 34), Paramahansaji relates the story of how, in 1861, Kriya Yoga came to be resurrected by Mahavatar Babaji for humanity at large. He instructed his disciple Lahiri Mahasaya in the ancient science, and told him that his role in life was to teach it openly to others (as had not been done for many centuries). From the earliest years of his mission in the West, Paramahansaji began developing a systematic course of instruction in the yoga principles and techniques that would prepare serious students for initiation in Kriya Yoga according to the requirements set in place by Babaji. This course was initially taught only in classes conducted personally by Paramahansaji, and included three basic techniques whose practice he felt was integral to the full effectiveness of Kriya Yoga: the Technique of Energization, the Hong-Sau Technique of Concentration, and the Aum Technique of Meditation. Since 1934, detailed instruction in all of the above techniques has been given in the Self-Realization Fellowship Lessons. The SRF yoga techniques of meditation — progressively higher methods for producing Self-realization and God-communion, given at specific intervals during one’s study of the Lessons. Practical “how-to-live” wisdom to help confront and solve the myriad problems of life, and create harmony and success in every area of one’s existence. Vibrant affirmations for applying the power of concentrated mind and will for self-improvement and spiritual progress. Divinely inspired prayers and poetically expressed experiences in Self-realization to awaken heart-centered devotion and desire for God. Scientific explanations of the principles and philosophy on which the meditation techniques are based — to satisfy your reason as well as your heart. Spiritual teachings on scientific health culture for prevention and healing of disease — physical, psychological, and spiritual. Instructive stories illustrating moral and spiritual principles for yourself and your family. A constant stream of inspiration — through the divinely charged words of Paramahansa Yogananda — to support and motivate your personal journey to life’s highest goal: God-realization. Spiritual counsel: Personal guidance and answers to questions regarding your practice of Paramahansa Yogananda’s teachings and techniques, provided by experienced SRF monks and nuns pledged to a life of seeking God through Kriya Yoga and selfless service to Paramahansaji’s work. A yearly Convocation held in Los Angeles: a weeklong intensive immersion in Paramahansa Yogananda’s meditation techniques and teachings, attended by thousands from all over the world. Regular letters and messages of inspiration and encouragement from the president and spiritual head of Self-Realization Fellowship, sent throughout the year. The Self-Realization Fellowship Lessons — as well as all their auxiliary and supporting content — are available to SRF students in digital form via a proprietary app that is available for Apple (iOS) and Android devices. This SRF Lessons app enables students to access the multimedia content provided with the Lessons and to benefit from studying their Lessons while away from home. Through January 31, 2020, students of the Self-Realization Fellowship Lessons will receive free digital access to the Lessons and exclusive auxiliary content through the SRF Lessons app. If you are a SRF Lessons student, please use your verified SRF Member Portal account to access the app or create an account. You will need your SRF Lessons Reference Number to verify your account. The SRF Lessons (basic series) is divided into 18 in-depth Lessons (approximately 24-40 pages each), each of which students receive every two weeks for 9 months. All of the basic meditation techniques that are preparatory to Kriya Yoga are mailed by the end of this period. Through January 31, 2020, we are offering the basic series of the SRF Lessons at a special introductory price — $90 for domestic (and $100 for international) — substantially lower than the regular $185 subscription fee. This price includes complimentary access to the digital version of the Lessons in the SRF Lessons app, and all the auxiliary content for the Lessons through January 31, 2020. Special note: We are introducing the new edition of the Lessons at the lowest price we can, so that the Lessons can be available to all who otherwise may not be able to afford them. We are only able to offer this low price because of the generous support that we anticipate from many members of Self-Realization Fellowship toward the spread of Paramahansa Yogananda’s work to people in all lands. If you are able, we would be very grateful if when enrolling you could also consider making a donation. This will allow us to meet our general operating expenses and extend the availability of Paramahansa Yogananda’s teachings to all sincere seekers. Please allow 2 weeks for the first Lesson to arrive. If you live outside the U.S., please allow 3 weeks for delivery. After practicing your Lessons for six months, I have found all you have taught me to be true. You have proven the existence of God to me, something I once thought impossible. Applying for the first time? It’s easy! STEP 2: Complete an application. STEP 3: Print, sign, and mail the pledge. Already a Lessons student or graduate of the Lessons? If you have subscribed to the SRF Lessons in the past, please log in to your account to bypass the full application process. How do the SRF Lessons differ from the other works by Paramahansa Yogananda, such as his anthologies and commentaries on the scriptures of East and West? The Self-Realization Fellowship Lessons are unique among Paramahansaji’s published writings in that they provide his confidential, step-by-step instructions in the yoga techniques of meditation, concentration, and energization that are described but not fully explained in his other works, which are for the general public. These advanced techniques are offered through the Lessons to all sincere seekers of truth—regardless of religious affiliation—and prepare for the Kriya meditation technique those who wish to consider a deeper commitment to this spiritual path. The Lessons have been newly enhanced and greatly expanded, making them the most comprehensive edition ever offered. This new edition contains a wealth of previously unpublished material from Paramahansaji’s writings and classes on the SRF meditation techniques and many other subjects on how to live a spiritually balanced and successful life. May I also continue other spiritual studies and techniques while studying the SRF Lessons? Paramahansa Yogananda welcomed those of every faith as students of his teachings. He explained that the results of practicing the scientific methods of yoga he taught come not from accepting a particular belief system, but from direct personal experience of God. He did advise, however, that combining spiritual techniques of different paths produces diluted results. Steadfastly following a single path and applying its prescribed methods will take you most quickly to your spiritual goal. How do I enroll in the SRF Lessons? Enrollment is simple, and can easily be done online. To begin, we ask that you create an online account and then you will be asked to complete the Lessons application. ENROLL NOW. Why is a pledge of confidentiality required for receiving the Lessons? From his earliest years of teaching the meditation techniques of the Kriya Yoga science and their accompanying principles, Paramahansa Yogananda faithfully observed the spiritual principles governing transmission of sacred knowledge. When he put those teachings in printed form, he perpetuated that tradition of confidentiality in the Lessons Pledge that all recipients of the Lessons are asked to sign as part of the enrollment process; and that practice continues today. What is the cost of the new edition of the Lessons? For the first year we are offering the basic series of 18 Lessons at a special introductory price of $90 for domestic (and $100 international) — substantially lower than the regular $185 subscription fee—in order that as many people as possible can benefit from Paramahansa Yogananda’s liberating instructions in the new edition. We are only able to offer this low price because of the generous support that we anticipate from so many members of SRF. If you are able, we would be very grateful if you could also consider making a donation when you enroll for the Lessons. This will allow us to meet our general operating expenses and extend the availability of Paramahansa Yogananda’s teachings to all sincere seekers. Can I share my Lessons with my spouse? Or do we need to enroll separately? Students are asked to sign up individually for the Lessons so they can work with their own copies—marking them as they wish for later review—to gain the most from their study. In addition, in order to register as a Lessons student and access the digital material available on the SRF Lessons app, one needs to create his or her own member portal account, which allows only one enrollment per person. I was a companionate student of the previous edition of the Lessons with my husband/wife/friend. Can we share the new edition of the Lessons? SRF discontinued the companionate program for the Lessons a few years ago. We therefore ask students to sign up individually for the new edition of the Lessons. Why has SRF released a new edition of the Lessons now, so many years after Paramahansa Yogananda left his body? The previous series of SRF Lessons originated in the 1930s. In the last years of his life, before his passing in 1952, Paramahansa Yogananda devoted himself to an intense period of writing new material and review of his previously published works. Among other projects, he worked personally with Sri Mrinalini Mata (who was then a young disciple and later served as the fourth president of Self-Realization Fellowship/Yogoda Satsanga Society of India). Paramahansaji reviewed the Lessons presentation with her and instructed her in his wishes for a thorough revision, noting a number of problems and defects that he wished to address. He told her to draw from the many writings and talks he had given in the intervening years since the Lessons were first compiled. “The Lessons will be your life’s work,” he said to her. The result of that “life’s work” is this new edition, completed shortly before her passing in 2017. More on the history and evolution of the SRF Lessons can be found in the “Overview” section of this page. How does the new edition of the Lessons differ from the previous Lessons? The new edition of the Lessons is the most comprehensive ever offered, and includes much previously unpublished teaching that was not available when the Lessons were originally created in the 1930s — featuring clearer and more detailed instruction on the SRF meditation techniques, including Kriya Yoga, and many other subjects. The new edition has been completely reorganized for clarity and ease of learning. The most essential principles of the SRF path have been distilled into a more systematic and focused presentation and sequence, so that students will find it much easier to learn, absorb, and practice the techniques and way of spiritual living taught by Paramahansa Yogananda. The enhanced and expanded edition of the Lessons includes a basic series of 18 Lessons, each 24 to 40 pages in length, mailed every two weeks for nine months. There is also an expanded series of Kriya Yoga Initiation Lessons. Also, a wealth of additional instruction from Paramahansa Yogananda is offered to students who complete the basic series, described in the “Organization and Sequence” section of this page. The Lessons are also available digitally on iOS and Android mobile devices through the new proprietary SRF Lessons app. Written, audio, and video auxiliary content will be available through the online member portal, as well as in the Lessons app. The basic meditation techniques are now taught much sooner after the student enrolls in the series. And instead of taking one year to prepare for Kriya Yoga, the new series makes it possible to apply for Kriya initiation after about eight months. Lessons on the techniques and other key subjects now are now consolidated into one comprehensive Lesson each, instead of being spread out over many separate Lessons as was done in the earlier edition. Additional in-depth Supplement Lessons have been created, using material from the previous series as well as unpublished material by Paramahansaji, including on various advanced topics never before explained in print. Clarification and elaboration of many points in the Lessons, done by Paramahansaji when he worked on revising them in 1949-51, including much new helpful information about the practice of Kriya. Much previously unpublished material has been added from the original source material and classes from which the 1934 Lessons were compiled — as well as from classes, writings, and dictation given by Paramahansaji in the years after the 1934 series was compiled. A careful review has been made of all the early editions of the Lessons, from 1923-34, in order to be sure this new edition incorporates everything authored by Paramahansaji for the Lessons. Why can’t I get the digital Lessons on my computer or Windows devices? At this time, the proprietary software for delivering these confidential studies is only available through our SRF Lessons app. We are exploring the possibility of making the Lessons available on computers and Windows mobile devices in the future. I am presently subscribing to the previous Lessons. Should I continue with them, or enroll in the new edition of the Lessons? We highly recommend that you enroll in the new edition of the Lessons to avail yourself of all the additional material available in this greatly enhanced and expanded edition. The Lessons series to which you have been subscribed will no longer be available after April 1, 2019, so you must select one of three options to continue your Lessons studies. 3. Receive the remainder of the current Lessons subscription only (mailed in one bulk shipment). Please note, that if you select this option, we suggest that you still study these Lessons at the recommended rate of one per week in order to fully absorb the material in each Lesson. Please indicate your choice by April 1, 2019, since the Lessons series to which you are currently subscribed will no longer be available after that date. Will my Lessons subscription automatically roll over to the new edition of the Lessons? If we do not hear from you by April 1 and you have enough Lessons credit, we will automatically enroll you for option 1 (transfer to the new edition of the Lessons only). Your remaining credit will be emailed as a credit coupon to be used toward other SRF purchases. If we do not hear from you by April 1 and you do not have enough Lessons credit to pay for the new edition of the Lessons, we will automatically enroll you in option 3 (receive the remainder of your current Lessons subscription only, in one bulk shipment). The sooner you make your decision, the more Lessons credit you will have to apply toward the new edition. Is the new edition of the Lessons available in other languages such as Spanish, Portuguese, etc.? Can I sign up to receive the Lessons only in digital format? I don’t want to receive the paper Lessons. We are offering the digital format as an additional resource but not as a replacement for the paper Lessons. Study of these sacred teachings is a powerful form of spiritual practice. An attitude of reverence and one-pointedly focused concentration is necessary to absorb fully the transforming vibration of divine truth that Paramahansa Yogananda’s words impart through the Lessons. For several reasons, digital devices are not as suited as printed material to helping you study in this focused, receptive state. Nevertheless, the digital version of the Lessons provides many benefits to the student when used judiciously in combination with the printed version (such as convenience while traveling, text searching within a Lesson, and bookmarking). I studied the previous edition of the Lessons some years ago. I know that students of the new edition of the Lessons have access to helpful auxiliary digital content, including instructional videos of the Energization Exercises. Can I get access to this auxiliary content without signing up for the new edition of the Lessons? Only those who choose to enroll in the new edition of the Lessons will have access to the digital auxiliary content as part of their subscription. Therefore, if you would like access to any of the instructional videos or other auxiliary content available online, you will need to enroll in the new edition of the Lessons. I am a Lessons graduate/Kriyaban. Do I have to apply again to receive the new edition of the Lessons? Can I receive them all at the same time? Those who are graduates of the SRF Lessons (as well as those who in the past may have completed some but not all of the Lessons) will not need to fill out another Lessons application, but will need to enroll for the new edition of the Lessons. You can enroll for the Lessons by signing in to your online member portal account and following the instructions given there. Because this expanded and enhanced edition contains much new material, all students of the Lessons, regardless of whether they are graduates of the previous Lessons or new Lessons students, will receive them one Lesson at a time, to be mailed every two weeks, so that they have the proper amount of time to assimilate the content. We are confident even if you studied the previous edition, you will find that going through the new edition, one Lesson at a time, will be profoundly inspiring and useful in re-energizing your spiritual life—and that you will also find a deeper inner connection with Paramahansa Yogananda and his lineage of Gurus. Remember: Spiritual study—in the focused, intuitive way taught in the Lessons—is in itself a powerful technique of soul-progress and attunement with the Guru. I am a Self-Realization Fellowship Kriyaban. Can I receive only the new Kriya Lessons, without going through the basic eighteen preliminary Lessons? No. Because of the way the new edition is reorganized and systematically presented, there is invaluable information in the basic 18 Lessons that is necessary for practice of Kriya. A significant portion of this information was not included in earlier editions of the Lessons. Therefore, all Kriyabans will greatly benefit from study of the new edition, starting from the beginning. The new edition of the Kriya Lessons will be available on a donation basis (after completing Lessons 1–18). I have created two online member portal accounts with different email addresses. How can I merge them into one account? Please email us, informing us of the email addresses of the accounts you have created and which email address you want to use going forward. Or, call Membership Services at 818-549-5151 M-F 9:00 am-12:30 pm or 1:30-4:40 pm, Pacific time.